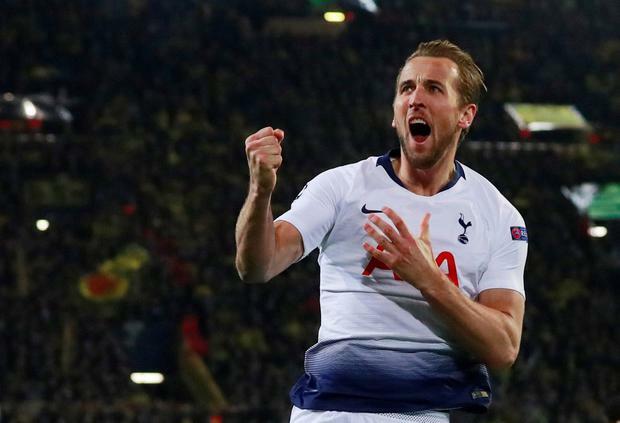 Tottenham Hotspur beat hosts Borussia Dortmund 1-0 on Tuesday thanks to a Harry Kane winner, to stroll into the Champions League quarter-finals for only the second time in their history with a 4-0 aggregate victory. Kane, who missed the first leg through injury, fired in the winner shortly after the restart to silence a fiery home crowd and leave Dortmund needing five goals after having lost 3-0 in London last month. Dortmund made their intentions clear with a formation that included five attacking players including captain Marco Reus, Paco Alcacer and Mario Goetze for the first time together in a starting lineup. They had more than 70 percent possession as Spurs pulled back, but after half an hour the best chance fell to the visitors when Son Heung-min, who scored once in the first leg, fired wide after breaking clear with only keeper Roman Buerki to beat. There were some worrying moments for Spurs late in the first half, but keeper Hugo Lloris made a string of superb saves to deny the hosts. Dortmund picked up where they left off after the break with Reus, who had scored twice in two previous outings against Spurs, coming close again. But Kane stunned the hosts when he was given far too much space at the edge of the box and scored with a thumping finish to kill off the tie. The visitors then had little trouble to manage the pace of the game against the frustrated Germans and book their ticket to the last eight in the competition.